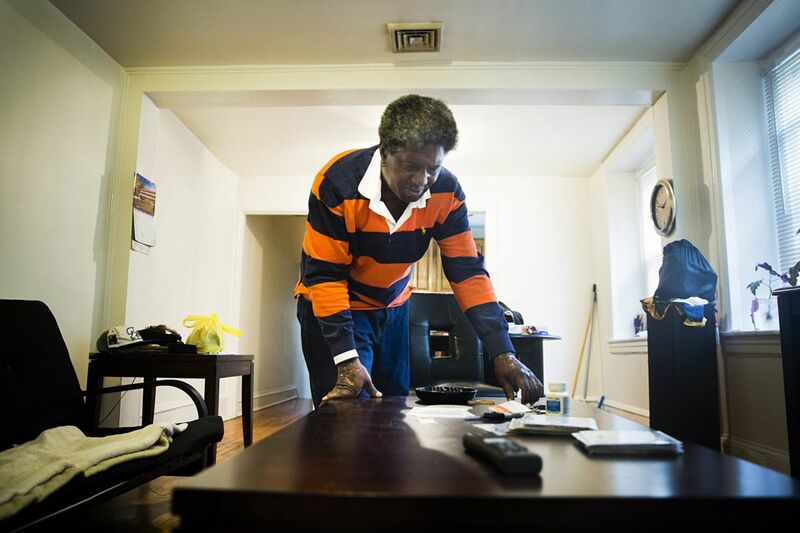 Emmett Paige, 61, and a client of Pathways to Housing, cleans his apartment in Germantown. Paige has been in the program for a year, and entered after years of homelessness and addiction in Kensington. As the city prepares to clear out two of Kensington's heroin encampments by its Wednesday deadline, advocates for those in addiction, neighbors, and city officials agree on one thing: The camp's residents will need permanent homes. Temporary space for some has been found in an expanding network of shelter beds in the neighborhood. But a housing program unlike any other in the country could provide a road map for getting to a more lasting solution. Pathways to Housing's housing-first program — meaning you don't have to be sober to get a home — for people with opioid addiction has been slowly getting people off the streets of Kensington for over a year. Mayor Kenney's budget seeks 60 more slots in a program that other cities struggling with the dual crises of opioid addiction and homelessness are looking to for inspiration. A year into the program, 54 percent of Pathways' 75 participants are in treatment or abstaining from drug use. Nearly everyone who entered the program has stayed. Among them is Justine O'Driscoll, who figured it was too good to be true when an outreach worker told her last August that a local housing organization had an apartment ready for her — with no strings attached, and no requirement for sobriety. "I thought, this is great, I have a place to get high," she said, laughing. By then, she had been homeless and addicted to heroin in Kensington, the neighborhood at the epicenter of Philadelphia's opioid crisis, for five years. It was hard to see a way out. But two months after moving into her apartment, O'Driscoll was in treatment. She'll be eight months sober in June. Housing-first programs are controversial; many shelters and supportive housing programs require some level of sobriety before entering. But recovery requires stability, said Matt Tice, the program's clinical director — which isn't typically found on the streets or in the shelter system. "We are trying to get people to tomorrow," Tice said. "You have no opportunity to recover if you're dead. And if you have a safe place to be stable, you have more of an opportunity to take these steps. Then you can have a chance." Pathways recruits participants through a number of outreach organizations in Philadelphia, and, once they're moved in, sends staffers by at least twice month to check on participants. Each week, Tice and his team of outreach workers meet to discuss their clients: who's doing well, who's struggling, who's ready to enter treatment. They assign social workers, doctors, and peer specialists — people who have been in addiction themselves — to help participants transition back into society. "By sharing our shared experience, we can help them problem-solve," said Joe Quinn, one of the program's peer specialists. Originally from Fairmount, he was addicted to opioids for 19 years before entering recovery about six years ago. He takes his clients to the movies, to baseball games, to get a slice of pizza and chat — anything to build relationships with them. He helps participants develop goals for themselves — whether that's staying clean, getting clean, or simply reducing their risk of overdose. Seven participants have died in the last year, all of them after a period of abstinence in jail, in the hospital, or in detox, which can dangerously lower a person's opioid tolerance. O'Driscoll remembers outreach workers checking in on her in the early days of her lease — "to make sure I wasn't dead," she said. She overdosed several times in her first two months in the program. But even as she was buying drugs in Kensington, she said, she noticed something curious: She felt protective of the place. She wanted to "live normal." And the outreach workers who showed up at her apartment to take her grocery-shopping or out for a bite to eat or a trip to Sephora convinced her it was possible. O'Driscoll is transgender, and having a place of her own made her feel safe enough to start transitioning, she said. "Every time I'd get clean, it always came down to my gender — I'd still hate the person in the mirror," she said. "I would be in rehab with all men, recovery with all men, and I'd be miserable. My apartment was a safe place to transition — to a different gender, but also to a different life." One morning in May, outreach worker Audrey Lundy pulled up to Emmett Paige's apartment on Germantown Avenue. Paige, 61, has been in the program for a year, and entered after years of homelessness and addiction in Kensington — and a heart attack that led him to get sober. He took Lundy around his apartment, showed her a loose baseboard he was hoping his landlord could fix, and asked her for help adjusting his thermostat. He'd pinned a collage of photos of Rocky Balboa to his wall and set a row of houseplants on his windowsill. The apartment was spotless. He tidied up for Lundy anyway. "My whole life has just changed over," he said. "I'm getting my friends back, my loved ones back — everything is coming back to life. It's like a new kingdom, to have your own spot, to say, 'This is mine,' to have something again."